WASHINGTON A leading ice scientist says there's a 50-50 chance that the North Pole will be ice-free this summer, which would be a first in recorded history. He says the weather and ocean conditions in the next couple of weeks will determine how much of the sea ice will melt, and early signs are not good. Mark Serreze is a senior researcher at the National Snow and Ice Data Center at the University of Colorado in Boulder, Colo. He says the chances for a total meltdown at the pole are higher than ever because the layer of ice coating the sea is thinner than ever. Mr. Serreze says there is nothing scientifically significant about the North Pole, but there is a cultural and symbolic importance. Preliminary February and March data from a NASA satellite shows that the circle of ice surrounding the North Pole is considerably thinner than scientists have seen during the five years the satellite has been taking pictures, NASA ice scientist Jay Zwally said Friday. He thinks there is slightly less than a 50-50 chance the North Pole will be ice-free. Last year was a record year for ice melt all over the Arctic and the ice band surrounding the North Pole is even thinner now. A large area at the North Pole and surrounding the North Pole is first-year ice, Mr. Serreze said. That's the stuff that tends to melt out in the summer because it's thin. A more conservative ice scientist, Cecilia Bitz at the University of Washington, put the odds of a North Pole without ice closer to 1-in-4. Even that is far worse than climate models had predicted, which was 1-in-70 some time in the next decade, she said. But both she and Mr. Serreze agree it's just a matter of time. I would guess within the next 10 years it would happen at least once, Ms. Bitz said. For the last couple of decades, there has been a steady melt of Arctic sea ice, which covers only the ocean and which thins during summer and refreezes in winter. In recent years, it has gradually become thinner because more of it has been melting as the Earth's temperature rises. Then, this past winter, there was a natural weather shift called the Arctic Oscillation, sort of a cold weather cousin to El Nino. That oscillation caused a change in winds and ocean that accelerated a normal flushing of sea ice in the Arctic. That pushed the older thicker sea ice that had been over the North Pole south toward Greenland and eventually out of the Arctic, Mr. Serreze said. That left just a thin one-year layer of ice that previously covered part of Siberia. So, it isn't your SUV that melted the polar ice cap. And by the way, even though the ice cap is supposed to be all but gone, New York City hasn't been flooded. Gee now Harper can convince his pals in Washington to free up a little cheap gasoline for the lawn mower we'll need to keep America's golf greens trimmed up around the pole! Who gets to claim any new islands? Well it seems only fair to base that idea on who uses the most fossil fuel in the world gets first pick. Golf is huge business, sounds like a plan. Oooo Oooo Oooo us first! I like golf...used to play...can't any more but still like the game. And of course it only makes sense that those contributing most to the thaw receive the benefits! Oh well then we lucked out, because officially for the last 10 months China has taken our lead. You are one ballsy guy! You'd like to paint the picture that the United States of Rampant Consumerism can be "let-off-the-hook" in terms of contributing more to global warming than anyone else....because recently China used more fuel? I understand....we'll just discount the decades of American four wheel freedom and blame the gooks! (By the way for those unfamiliar with the term "gook" is an Asian word that was bstardized by the west as a perjorative term for anyone with an epicanthic fold fold.) No offense intended anyone just trying to get into the spirit of spreading around the blame....its an American tradition. New York wouldn't be flooded if the entire northpole melted,the Ice in the Northpole(arctic) floats like an ice cube in a glass of water. It's the southpole (antarctica) that matters since all the ice is ON the land down there, and that would flow into the sea adding to the volume of water. You'd like to paint the picture that the United States of Rampant Consumerism can be "let-off-the-hook" in terms of contributing more to global warming than anyone else....because recently China used more fuel? Took a while for the U.S. bashing to start on this thread. C'mon folks, you're slowing down. ...The scientists say the heat released by the explosions is not contributing to the melting of the Arctic ice, but Sohn says the huge volumes of CO2 gas that belched out of the undersea volcanoes likely contributed to rising concentrations of greenhouse gases in the atmosphere. How much, he couldn't say. ...... Mr. Serreze says there is nothing scientifically significant about the North Pole, but there is a cultural and symbolic importance. Last August, the Northwest Passage was open to navigation for the first time in memory. Preliminary February and March data from a NASA satellite shows that the circle of ice surrounding the North Pole is considerably thinner than scientists have seen during the five years the satellite has been taking pictures, NASA ice scientist Jay Zwally said Friday. He thinks there is slightly less than a 50-50 chance the North Pole will be ice-free. He thinks there is slightly less then a 50/50 chance the NP will be ice free? Does that mean less chance of it happening, or less chance of it not happening? .....A more conservative ice scientist, Cecilia Bitz at the University of Washington, put the odds of a North Pole without ice closer to 1-in-4. Even that is far worse than climate models had predicted, which was 1-in-70 some time in the next decade, she said. Well of course it is... anybody and their monkey could tell you that. The bigger question is "What's your point? What are you getting at?" It's going to melt, it's supposed to after so many centuries etc. Guess what? Nova Scotia still isn't anymore under the Ocean then it was several years ago..... who cares? That's the way she goes and unless we decide to build a Super Ice Ray Gun on the Moon to shoot back at our planet to keep it cool.... there's not much we're able to do about it. Even if we could just make the whole thing snap right back to the way we "Think" it should be in a day and everything went back to normal, imagine the actual shock to the entire eco-system it would have if that occured..... and is that such a good idea? 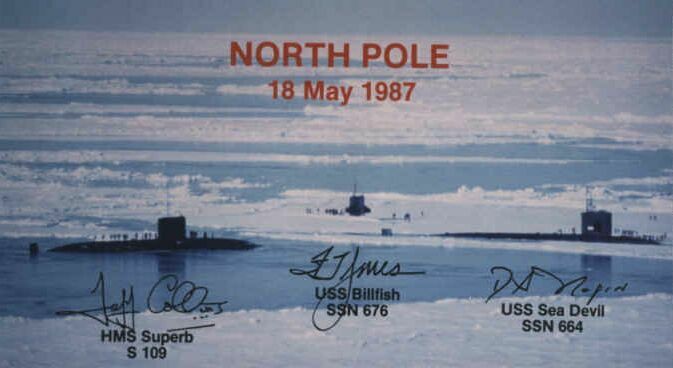 Recently [and according to Yahoo news] the Russian expedition in the North Pole, with its 20 members have been withdrawn; because their frozen area has been molten. Therefore, is this a Russian propaganda to obtain taxes, in addition to the alleged US propaganda!!? Last edited by eanassir; Jul 17th, 2008 at 10:45 AM.. In order for the ice to be gone from the north pole, the temperature would have to rise drastically throughout August. I can't see it happening. Ever tried to melt a block of ice 1.9 meters thick in temperatures around 0C? It doesn't happen fast. 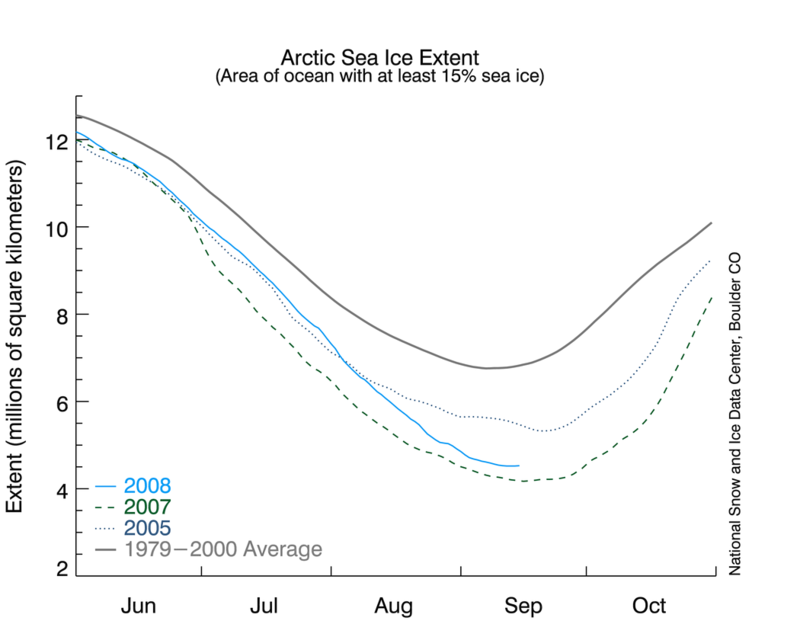 We have reached the apex of Arctic ice-melt for 2008, about 750,000 square km less melt than last year. There is about 3.75 million sq.km. 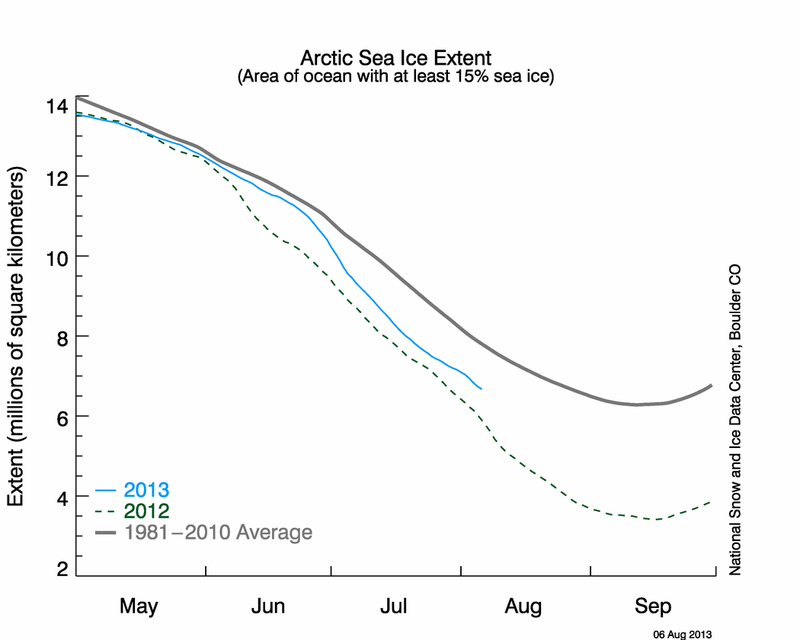 of ice on the Arctic Ocean; so much for an ice-free Arctic. Maybe next year Al and David can rejoice. Bloody AGW's. On the up side, real estate is quite cheap up that way. Get yours today and be the first on your block to go Arctic! 50/50 huh? I don't believe it, that's too good a prediction for current models; sounds like a wild guess. We have news from the National Snow and Ice Data Center (NSIDC). They say : The melt is over. And we’ve added 9.4% ice coverage from this time last year. Though it appears NSIDC is attempting to downplay this in their web page announcement today, one can safely say that despite irrational predictions seen earlier this year, we didn’t reach an “ice free north pole” nor a new record low for sea ice extent. Ice cap melting? Good news. Now if we could just fix it so the climate never changes again in a million years I will plant a palm tree on Hans Island.